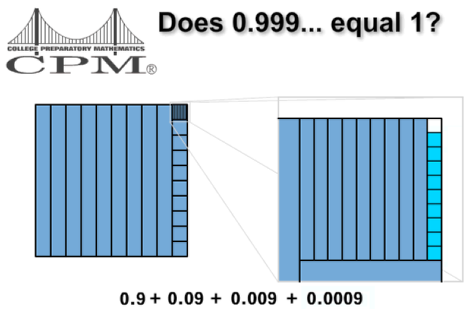 This lesson includes a video animation to demonstrate how 0.999... can geometrically be represented as a sum of fractions that converge to 1. Click the link below to watch the 42 second video. 1. What happens when you add all of the parts? Project this animation at the specified point in problem 1-42 to provoke discussion about using geometric representations of numbers to help make sense of their size. Test the technology setup before students arrive to be sure that it is working properly. The animation is less than a minute long and moves quickly. You might want to have the students first watch the animation at full speed. Then, replay the animation, pushing the pause button each time the shape is further divided to give students a chance to look more closely at the graphics. Pausing periodically also provides an opportunity to check students’ understanding of the divisions that have been made to that point.